Some gear cannot be pigeon-holed so easily due to diversity. Multi-effects units are one example, but then again those can be compared among themselves. But with the Philosopher King by Pigtronix we are looking at a true-bypass, transparent boutique pedal that has integrated a number of useful tools into a powerful engine located under one hood. It certainly is not a multi-effects processor as we have come to know it, but at the same time it certainly is not your typical one-trick-pony pedal fare. The challenge in developing a pedal that has more than one use (e.g., a fuzz pedal) is to have all the functions coordinate and make sense so that one aspect merges/complements with the other elements. What Pigtronix has done with the Philosopher King is to provide musicians a means of expressing sound in unique and somewhat non-traditional ways. It’s a pedal that would have been comfortable in early Pink Floyd recordings since it allows so many diverse sound possibilities that range from the subtle to the almost absurd. To describe the Philosopher King in simple terms, you have three sections: Compressor (drive/distortion), Swell and Fade. As straightforward as that sounds, Dave Koltai, the President and key designer of Pigtronix, placed much thought into each part of the whole and to what this pedal offers. Let’s start with the Compressor/Distortion section. The Volume knob controls output; the transition in loudness is smooth, and like all knobs on the pedal it feels solid and silky to the fingertips when turning. This doesn’t seem too exciting so far, but it does get better! The Compression knob allows you to control the degree of the ‘clean’ and ‘distorted’ signal, from completely clean (ideal if you want to use all the other features on this pedal with other dirt pedals) to a completely distorted tone that has a good degree of sizzle, yet remains clear and not muddled in the mix, even when playing in the lower register. As stated, this smooth distortion (it’s not fat or crunchy, at least not on my gear through a clean amp) plays very well with other dirt pedals and the natural drive within tube amps. I have a few favourite dirt pedals and what was obvious is that the transparency of the Philosopher King merely enhanced the characteristics of the other pedals without causing any noticeable tonal changes. This is ideal if you like the raunchiness of a particularly pedal, but want to take it one step further in graininess. Speaking of which, there is a Grit knob that adds additional ‘grain’ or edge to the distortion. When turned off and the Compression turned full the distortion remains very smooth and sweet sounding, although boisterous enough for classic rock playing. With the added grit, particularly full steam, you get a nice ‘breaking up’ tone to get your music a little more ‘down and dirty.’ Lead playing sounds very nice with both elements up full. The Sustain knob adds exactly that, allowing for longer note holds, which is essential for those emotional lead solos. If you get a good 5-second sustain without this option, then you can get a solid 10-second sustain with it... and that’s without cranking an amp at high levels! Finally, there is a Treble knob that invokes a 2Khz boost or cut, depending on how dark or bright you like your playing. Harmonics ring truer with this feature turned up full, which is how I prefer it as I usually keep my amp in a non-cranked ‘flat’ response. I like the Compression aspect enough that the pedal stands on its own, which is obvious when one considers that part of the pedal combines Pigtronix’s Philosopher’s Tone and the once existing Attack Sustain pedal. But it’s the envelope filter (polyphonic amplitude modulator) attributes that make the Philosopher King a unique soundscape tool if you’re looking for that extra dimension in your music. The Swell knob determines the duration of time it takes for a note to expand from silent to full volume. Pick triggered, if playing chords or soloing with less aggression this is a nice feature to include with the knob turned up only slightly. What you get are soft expansions of notes without harsh edges, giving music a more dreamy or delicate quality. Obviously the more you turn up the Swell knob the more you achieve symphonic string-like responses, reminiscent of the synth introduction to Led Zeppelin’s All of My Love. To engage and disengage the effect requires nothing more than a touch of the finger/pick followed by a palm mute. The Fade knob works with or without the Swell feature, and obviously creates sounds in the opposite manner, viz., the duration of time it takes for a note to fade out from full volume to silent. The effect of this feature reminds me of a reverse delay (in that it sounds peculiar in a good way), with notes disappearing but without cutting off sharply. Moreover, you have the ability to fade note(s) out from peak level only partially by use of the ‘hold’ control (which sustains the note), thus bringing the audio down to a predetermined level and making the fade sound very natural (useful for high gain playing to eliminate those transient ‘ticks’ and ‘clicks’ if playing gets a bit loose). When combined with the Swell, depending on the settings, you can achieve anything from a mesmerizing vibrato to a rapid oscillating sine wave, to ghostly notes that appear then disappear as though my magic. Like I said, Dave Koltai and his team really thought out this pedal when they decided on all the remaining options, which take the Swell and Fade concepts to the extremes. 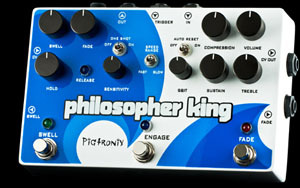 As mentioned, the Philosopher King includes a Hold knob that mixes the post-compressor audio with the modulated audio. The more ‘hold’ you include the less volume is loss during the Fade cycle (if Fade is chosen in the mix), which means varying pulsating patterns and potentially less noticeable fades for those subtle requirements. The Sensitivity knob controls how much input signal is required to ‘reset’ the Swell/Fade cycle. If you stop playing there is an obvious stopping of the cycle and this is described best if you think of those string/synth sounds – strum a chord and hear the notes swell up, then stop the chord and it fades or ends. Like your hands controlling the reaction of playing, the Sensitivity works in the same manner by governing your input signal and how it reacts with the Swell/Fade cycle. Just with this one knob there are many variations of sound you can produce with all the same settings. Next, and what makes this pedal easier to learn and become accustomed to, is the Release LED, which tells you when the pedal is ‘armed’ and ready to begin the Swell and/or Fade cycle – it provides a visual cue so that you’re not restricted to coordinating your playing only by ear. When a note is played the Release light turns off and the Swell/Fade cycle begins. Once the cycle is over, the LED shines bright. I found this feature helped me to fine-tune what I was trying to achieve with a particular song or a part of a song when I wanted to dial into a particularly rhythmic pattern/sequence within the Swell/Fade cycle. So far we covered the basics of swelling or fading. There are three toggle switches that add to the diversity of the Philosopher King and in different ways. The One Shot toggle, when switched on, causes the Swell/Fade functions to ignore any input signal once the cycle starts. In effect, you can play whatever you want without retriggering the modulation cycle. To put it another way, the cycle plays one time for that immediate effect then remains off until you stop playing (or step on the footswitch to disengage it). The Speed Range controls the nature of the Swell/Fade and the switch coordinates with what you are playing, viz., if you’re doing slow swells, then choose the slow setting for a wider palette of control; conversely, working with fast oscillations work best when the speed range is on fast. The Auto Reset is something that I like to be on most of the time. It allows for a tremolo effect, although not always in the conventional way and depending on how you set the controls. Generally speaking, think of it as a ‘repeat’ function, but not exactly an echo (since the repeating signal does not fade unless you choose it to). When combined with an echo pedal you can get some really spacey effects... and with the swell/fade set low you can produce super-fast oscillation patterns that typically would be the domain of a synth. If you were to keep this feature off, you then must mute your instrument to set the cycle up for a re-trigger (viz., you determine the exact timing for the beginning of the next cycle through playing control), but with the switch on the cycle is automatic while you play. Besides the basic ‘in’ and ‘out’ for your instrument, there are a few other outputs, some of which are beyond the scope of my use, and others that are two-thumbs up for my purposes. There is a trigger input that allows an external source to control the timing of the Swell/Fade cycle. There is a CV in and out, both of which utilizes a CV control or a TSR expression pedal (the ‘in’ controls the amplitude modulation so that you can manipulate your instrument’s volume [the expression pedal becomes an active volume pedal]; the ‘out’ controls the modulation voltage and goes to an external recipient like a modulator synth). My interest peaked with the other inputs... options for Swell expression and Fade expression. This allows you to kick in the effect at any time (as you would stepping on the engage switches) by utilizing an expression pedal; but now the degree of the effect can be controlled, from fast oscillations to long, gradual swells or fades and while playing. By using an optional expression the degree of customization and variation in compositions increases significantly and is worth the added pedal/investment to get the most of the Philosopher King. A good sounding dirt box that offers custom envelope generation not found typically with dirt boxes; offers sufficient flexibility to expand one’s playing ability and compositions; includes power adapter. Since there is so much to this pedal, it takes some time getting used to (as a consequence, trying it out at a music store may not provide sufficient time to explore its full potential). MSRP is $399; MAP is $299.